The Photography Committee presents its third Calumet Gallery show, Encounters with Nature. This December, 52 of our members will display 105 of their best nature photographs in an expansive group photography show. Following the success of our previous Calumet show, award-winning photographer and former Exhibit Director of the Westchester Photographic Society, Anastasia Tompkins, once again juries our images. Our well-traveled member photographers will exhibit landscapes, wildlife, macros and abstracts photographed throughout the United States and the world. We hope our photography captures nature’s beauty and majesty and that people come away with a renewed desire to preserve and protect our planet’s magnificent treasures. 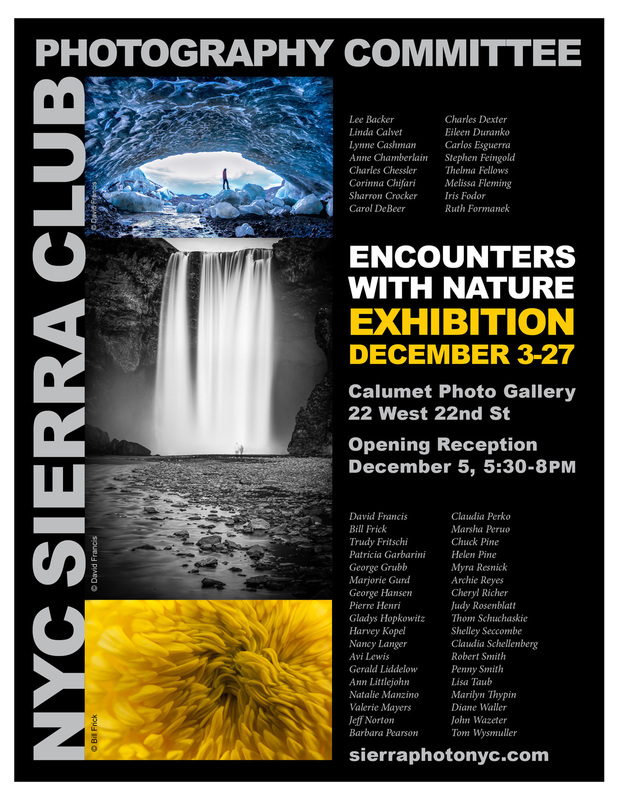 Encounters with Nature will be open to the public from December 3 through December 27 at the Calumet Galley, 2nd floor, inside the Calumet Photographic store at 22 West 22 Street (Between 5th and 6th Avenues), NY. Gallery hours: M-F, 8:30 am–6:00 pm, Saturday, 9:00 am–5:30 pm. There will be a gala reception, with wine and refreshments for the photographers, show organizers, Sierra Photo members and their friends and families on Thursday, December 5, from 5:30 pm to 8:00 pm. A portion of all sales will benefit the Sierra Club.